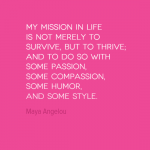 Find inspiration from a series of quotes from a famous African American author, poet, singer, actor, writer, mentor and academic, Maya Angelou. Maya Angelou was born in Missouri, USA in 1928. She has published 7 autobiographies, 3 books of essays, and several books of poetry, and is credited with a list of plays, movies, and television shows spanning more than fifty years. She has received dozens of awards and over 30 honorary doctoral degrees. 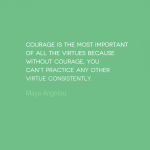 Angelou is best known for her series of 7 autobiographies, which focus on her childhood and early adult experiences. The first, I Know Why the Caged Bird Sings (1969), tells of her life up to the age of 17, and brought her international recognition and acclaim. In 1959, after various careers including that of a singer and dancer, she met novelist James O’Killens who encouraged her to move to New York and focus on her writing. In 1961, she met South African freedom fighter Vusumzi Make with whom she had a son. The couple moved to Cairo and then to Ghana and she became active in the African-American expatriate community. In 1965, she returned to the US and published her first autobiography I Know Why The Caged Bird Sings in 1969. Her autobiography brought her widespread international acclaim and recognition. In the 1970s and 1980s she worked as a composer, wrote articles and short stories, TV scripts, documentaries, autobiographies and poetry, produced plays and was named visiting professor of several colleges and universities. She also worked as an actress and was nominated for a Tony Award. During this period she also became close friends with Oprah Winfrey and became Winfrey’s close friend and mentor. Angelou has been honored by universities, literary organizations, government agencies, and special interest groups in what has been, against all odds, an extraordinary life.